As a child I heard my Dentist give a talk about Plaque. His talk focused on how much sugar was included in different foods and how that sugar was transformed by plaque into acids. To prevent the acidic decay caused by sugar, he encouraged modification of our diets and diligence in removal of plaque by means of brushing and flossing. To this day, plaque is still considered a serious problem, however the depth of our knowledge regarding this destructive process (also known as “Caries”) has deepened with recent advances in science and technology. Scientists have isolated a host of conditions and factors that significantly increase the risk for decay. They’ve also identified a test to help predict the likelihood of future decay, and have engineered dental home-care products that can reverse the conditions, help balance pH, and prevent decay! For fifty plus years, Dentistry has been The Health Profession that promoted PREVENTION. 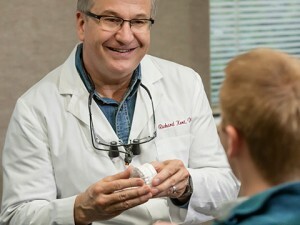 As a dentist I constantly strive to be on the cutting edge of new technologies and scientific advancements in order to help my patients lead a healthier life with a brighter smile. At your next visit, be sure to ask about “CAMBRA” (Caries Management By Risk Assessment)! The results have been truly remarkable! © Monterey Dental Contours. All rights reserved.